Last week we were sent the brand new Hey Duggee magazine to try out and this week we got another lovely surprise as Chunk was asked to test out some toys from the Hey Duggee range and some badge challenges! 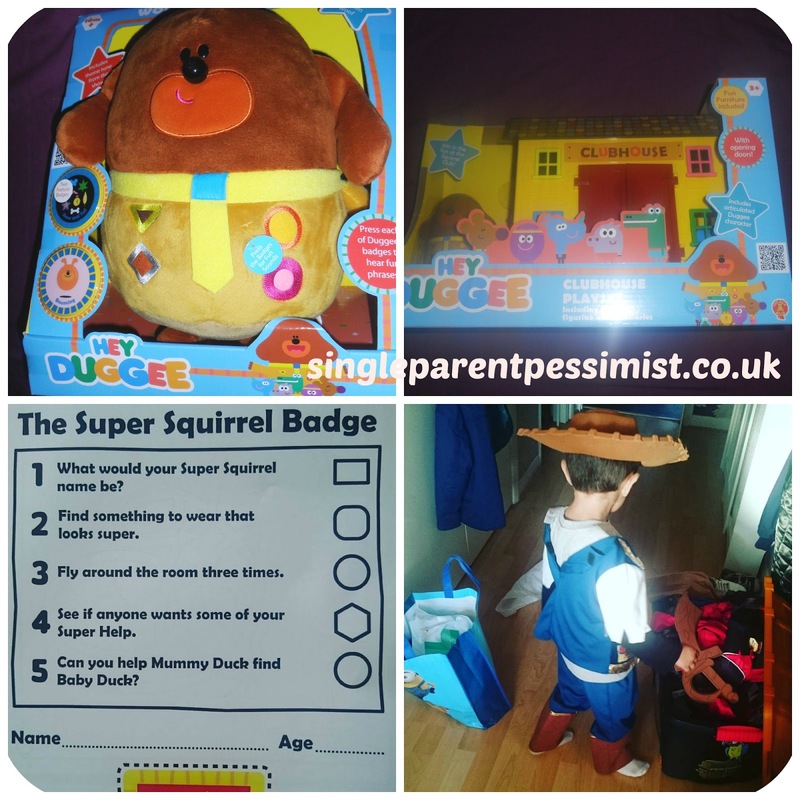 As I've mentioned before, Hey Duggee is one of Chunk's favourite programmes (and mine) and he loves the idea of being able to earn his own Duggee badges like the squirrels do. He was sent four challenges with the aim to earn the Drawing, Bouncing, Jam and Super Squirrel badges. As you can see in the pics he earned his Super Squirrel badge by making his own superhero costume which was a mixture of Woody and a pirate. He then had to fly around the room three times which he is doing in that photo up and down the hallway! The badge also had a little maze to complete which he enjoyed doing and he was then awarded his badge. These challenges are so much fun to do during these awful, dreary and cold days so I intend to complete them all with him this week (check out #duggeebadge to see how everyone is doing it!). Chunk loved the Woof Woof Hey Duggee Soft Toy and Clubhouse Playset. The soft toy is a gorgeous big Duggee and he has four badges on his jumper which are interactive. One button is the theme tune and the others feature some of the quotes from the show (such as Duggee hug!). You can pat his head to hear him make sounds and he comes with two Duggee badges that can be displayed. Chunk enjoyed using his clubhouse when he was watching the programme and using the Duggee squirrel finger puppets he got from a CBeebies magazine a few months ago. He has been "helping" them to earn their badges in the clubhouse by playing the role of Duggee and it's been hilarious to watch! These toys are really good at helping to further open Chunk's imagination and to encourage him to do things to help people to earn badges, pretty much like I did at Girl Guides back in the day. We have been making up our own badges that the squirrels can earn and have role-played little stories. If you have any Duggee fans in your family I recommend checking out the new toy range whilst you're doing your Christmas shopping as it's rare I find toys that I enjoy playing with too lol! Chunk was sent the soft toy and playset to test for the purpose of this review. No payment was received and all opinions are honest and my own.